For the past 10 years I had a party this weekend at the Basin to celebrate being clean and sober. This year would have been 11 — but I didn’t have it. SOB had a 10 year run. Maybe it’ll happen again next year. I celebrated 11 years clean and sober on 4.16.07. Feels great. This year, I made the party personal. I guess it was always personal, but this year it was just me. So I spent yesterday and today at the Basin. Both days I spent time on the East Wall. Yesterday I skied Gauthier. Super steep, super dangerous. Yesterday the snow on Gauthier was slick. I was really careful. I don’t know how many more Gauthier’s I have in me. I have a family to support, I’m not into taking risks to feel alive. But it was good to ski it. I didn’t ski it last year because by the time I started skiing the Basin Gauthier was closed. Saturday started off with a few laps then a trip up to the North Pole. I was going to drop into 2nd Notch, but it was too sketchy. You have to lower yourself into 2nd Notch. Below the snowboarder was his buddy on skis. His buddy was having a hard time getting his skis on. Then it was a trip over to Pali (“Pallavicini Lift”) and Gauthier. Like I say, it was good to ski Gauthier. But it was definitely no fall zone. if you fall you’re not going to stop yourself. You’ll be in a free fall, you’ll hit trees, rocks, or both. I don’t know how many more “no fall zone” runs I have in me. I’ll be 59 soon. After Gauthier I did a few more laps on Pali then went to listen to the bands. On Saturday’s in May the Basin always has two bands – one outside and one inside. Sunday, today. Of course I’m in the van. You have to get to the Basin early, to get a good parking spot. I did. I closed the curtains, took a nap while letting the snow soften up. Then it was time for Willy’s Wide. I’d never climbed Willy’s, always wanted to. It’s a tough climb. I needed poles to help me with each step. The snowboarders needed to use their board to pull them up each step. Here’s a view of the Willy’s Wide hike looking across the mountain from the top of the Pali chair. I drew a line up the stair case from the gate to the top. At the top of the hike I met a nice fella – Evan. And I saw the Leif Borgeson Memorial. Leif was the ski patrol director at the Basin for years. He died from a heart attack while hiking up Highland Bowl. Here’s the memorial at the top of Willy’s Wide and the “Leif” sign at Highlands. The sign at Highlands is at the top of what’s known as the Steep Pitch, skiers right where Leif had a heart attack and died. Highlands patrollers made a sign. His sign looks out toward Maroon Belles. Aspen people can be turkeys and snobby. Most of them I work hard to ignore, because they’re so…Aspen. I’ve heard innuendo at Highlands that brother Leif’s heart attack was perhaps due to him not being fit, or he worked at a front range ski area and therefore Highlands was out of his league. Maybe the Steep Pitch was too much for him. I didn’t know Leif. But I think it’s safe to say Leif climbed Willy’s numerous times over the years. Willy’s is steeper and harder than the Steep Pitch on Highland Bowl, where he died. I’ve skied everything at Highlands. I know it better than most. Gauthier is as steep as anything I’ve skied at Highlands. There’s other pitches at A-Basin such as West Turbo or Water Fall at the bottom of Fourth Alley that rival anything at Highlands. The base of A-Basin is at elevation higher most of Highlands. 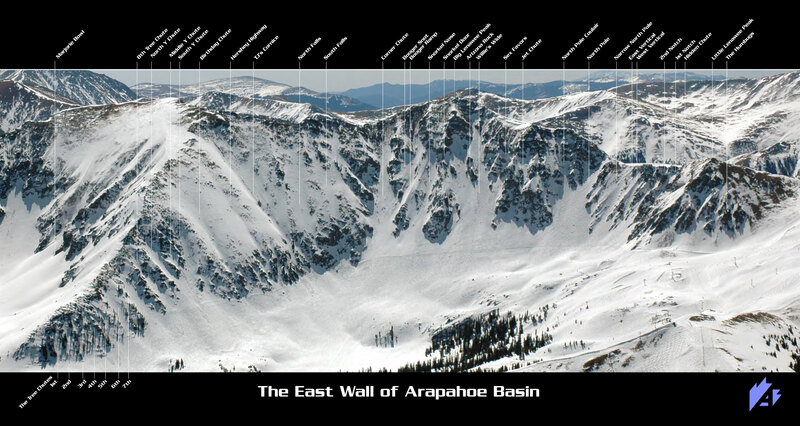 Most of A-Basin is above tree line, most of Highlands is below tree line. The top of A-Basin is higher elevation than the top of Highland Bowl. It was just Leif’s time to go. Here’s a video someone put together for Leif. Skip to 11:40 and you can see the guys at Highlands and I think Ajax waving happy trails to Leif. Very cool. Ski patrollers are an odd lot. They’re like Misfit Toys, that finally found a happy home. Jonesy is a patroller at Highlands, I’ve gotten to know some of the guys there. They’re cool. And if it wasn’t for them, I wouldn’t get to ski the lines I do. Skiing with Jonesy has made me a better skier. Back to the top of Willy’s. You can go up even further, to get to the “Snorkel” lines. Next year. I wouldn’t want to do the hike if it was windy – because the wind would knock you over backwards and you’d tumble down the pitch. After the East Wall I did a couple laps on Pali and called it a day. I rode the ski bus to A-Basin from Denver in the late 60’s. I hitchhiked there from Denver in the 70’s. I’ve always loved the Basin. But now, I’m in the zone, really feeling the vibe there. Next year I’m going to drive past the Beav, maybe skip a few Highlands days, ski the Basin. I want to explore more of the East Wall. I’ll ask Alan Henceroth if he’ll show me some lines. There’s nothing like the Basin. It’s everything that’s right with the ski business. I’m grateful I get to ski there. I loved the detail, so happy to hear your adventures! Man, I wish I was there with you. Looks like a blast! Awesome! So glad to hear about another SOB celebration, even if it was more low key than in years past. Find your center, find your peace, and shred the steep stuff (within reason, naturally). Greetings from the swamp!